Get away from it all and spend some time nestled between the rolling mountains of North Carolina. 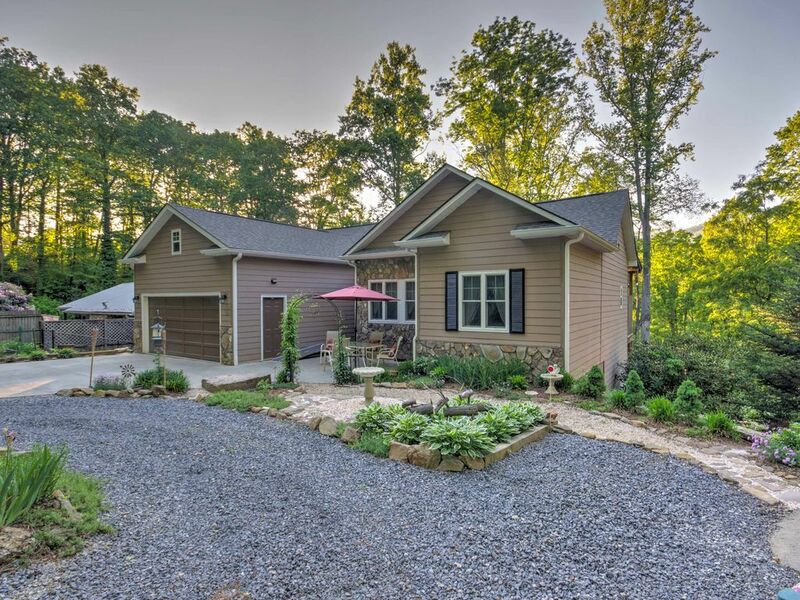 'Valley View' is a wheelchair accessible 3-bedroom, 2-bathroom vacation rental house in Maggie Valley with easy access for motorcycles and covered motorcycle parking. The house is situated on a picturesque property, perfect for 8 guests who'd like to explore Great Smoky Mountains National Park, tour Asheville, visit the Biltmore Estate, or just relax in the private hot tub on the deck. This house is wheelchair accessible. One level living on the inside and a ramp outside for the two front steps offer adaptive accessibility for all who want to enjoy a mountain getaway! The house is perfect for motorcycle enthusiasts, who can park their motorcycles in the covered spot upon arrival. The cathedral ceilings and open floor plan make this 1,400-square-foot home feel even larger than it is. The massive stone fireplace in the living room and exposed wood beams are cozy reminders that you’re tucked away in the mountains. On chilly North Carolina evenings, curl up on the comfy couches in the living room and turn up the heat on the gas fireplace - it’s the perfect way to warm up! In the mornings, step out onto the front porch to enjoy your coffee while watching the sunrise. The only sounds you’ll hear in the early morning are the chirping birds and the wind rustling through the forest. After a long day of exploring the forest and valley, head out to the back deck and hop in the hot tub to soothe your aching muscles. The back deck is also an incredible place to relax with a cold drink and watch the sunset behind the trees. The large, fully equipped kitchen has all of the appliances and counter space you need to prepare your favorite meals in the comfort of your home-away-from-home. There’s a dining room table with seating for 6, as well as a breakfast bar, which can seat 4. The gas grill out on the deck is perfect for grilling up tasty meals on warm evenings. There are also several outdoor tables that are ideal for dining al fresco. Once the sun has finally set, and it’s time to go to bed, find comfort in any of the cloud-like beds. The master bedroom and second bedroom feature queen-sized beds while the third bedroom boasts 2 twin beds. Additional sleeping can be found on the sleeper sofa in the living room or on the large deck, where you can sleep under the stars! Don’t forget to pack your hiking boots and camera. There are plenty of amazing hiking trails around Maggie Valley. The amazing hiking trails and great views in Great Smoky Mountains National Park aren’t to be missed! Soco Falls, which is about 8 miles away from the house, has some of the most stunning waterfalls you’ll find in North Carolina. Ride your motorcycle through the serene landscape with ease and let your worries blow away in the wind. If you’re looking for some more big-city action, Asheville is only 30 minutes away. The city has tons of great restaurants, and stores that are sure to appeal to everyone in your travel group. Asheville also has a variety of festivals that run all year long. Just outside of the Asheville city limits, you can visit the Biltmore estate. Take a tour of the 178,926-square-foot mansion and explore the massive grounds, which include several gardens and a winery. Family-friendly games and rides are just 1 hour and 30 minutes away at Dollywood Park in Pigeon Forge. - Amenities include a fully equipped kitchen, an optional wheelchair ramp (Inquire with Evolve if you will be needing the ramp), large deck, hot tub, gas grill, gas fireplace, flat-screen cable TV, free WiFi, Netflix, air conditioning, in-unit laundry machines, driveway parking, easy motorcycle access, cover for motorcycle enthusiasts, and more! - This house is wheelchair accessible. One level living on the inside and a ramp outside for the two front steps offer adaptive accessibility for all who want to enjoy a mountain getaway! - Incredible location in the woods, nestled in between the Nantahala National Forest and Great Smoky Mountains National Park, easy access to fun activities in Asheville and the Biltmore Estate! - No events, parties, or other large gatherings. If any evidence of these are found, a fine of $100.00 will be charged to the guest. Loved every minute of our time at Valley View! The house was very clean, well-organized, and inviting. The beds were all comfortable and the bathrooms were perfect. We didn’t need a handicap accessible bathroom, but I would keep that in mind for my mother. Every thing was perfect: towels, hot tub, dishes, refrigerator, open-concept, and an awesome large deck overlooking Maggie Valley. Would highly recommended this place for your next family vacation; besides the house, it also was in the perfect location near the Blue Ridge Parkway and many other tourist attractions. Incredibly beautiful, spacious & cast cabin! This cabin had everything my family was looking for in a relaxing vacation. There’s a spacious wraparound porch, grill, hot tub, and we were only a few minutes away from beautiful hiking trails and horseback riding. My kids loved the rustic bunk beds in their room, snuggling up by the fireplace, and star gazing from the hot tub at night. The cabin has great layout and offers a lot of space for everyone, so we found it to be very family friendly. The entire property was very clean and well-maintained. The location was easy to find and the roads leading there were safe and easily to follow. I would definitely reccommend this cabin to others! We stayed at the house for 12 days and thoroughly enjoyed it. The bedrooms were comfortable and the living areas set up nicely for relaxing or enjoying a meal with the family. The kitchen had just about everything I have at home (even a crock pot we used for soup on a cool, rainy day). The master bath has a nice big shower and an oversized jetted tub that was definitely a perk. Almost everything we wanted to see and do was an hour or less away. Just remember to grab extra toilet paper, paper towels, dish and hand soap etc when you visit the grocery store to stock the kitchen and you’re all set. The setting was beautiful & we’d love to visit again. This was a three bedroom two bath home located just off the highway in Maggie Valley. The best thing about the house is the location, close to the highway with no steep driveway. Close to restaurants and shopping. It is located on a short street with neighbors on both sides and the back. However, I felt like we had plenty of privacy and I never even really saw or heard the neighbors. House has a very nice large back porch, very peaceful and private. There is parking for two cars in the driveway and one more car in a small gravel pull through driveway. The house has one family/dining/kitchen area which is nice and cozy for a family gathering. There is also a gas log fireplace with remote control, very nice and easy to operate. Overall, the house had a well-stocked kitchen plenty of towels and blankets, etc. The local contact, Pat, was able to provide us a pack and play for our infant which was a nice touch. One area that the house was lacking was entertainment/television. There is a large flat panel TV and DVD player, however there was no DVD remote so we could get picture but no volume, very disappointing. Also there is no cable or satellite channels, only Netflix and some other Internet channels. No ABC no NBC no CBS no Fox etc. Would have been nice to see a local news or weather program. Other small things included a broken light in the refrigerator, broken handle on washing machine and worn out pads on dining room chairs. Could also use a manual dish drying rack as there was no place to put clean dishes we washed by hand. We did not use the hot tub, but when I opened the cover there was an extremely strong chlorine smell much stronger than it should have been. If you are staying a week make sure you bring garbage bags, toilet paper, paper towels, hand soap, dish soap, shampoo, coffee filters etc. as none of that is provided. You must also take away your own trash which is an annoyance, but seems to be fairly common with mountain mountain cabin rentals. Cabin is managed through a third-party instead of the owners directly. This increases the price of the rental. Overall, the house suited most of our needs but could be much better with a little more attention and effort by the owner. I have rented many nicer cabins in WNC for less money. The photos make this place look much bigger than it is. All the bedrooms are clustered together. The only way it sleeps 8 is if multiple people are on pull out sofas- one of which is located on the porch. It had a nice view with a very pretty backyard that was basically impossible to get to. The hot tub was a nice feature and one of the reasons we booked this place but for being rated as an 8 person house the hot tub only fits 3 maybe 4 people comfortably. The towels are terrible here- we wish we had brought our own. I will say the location is perfect and its close to everything Maggie has to offer. The road to the house is paved and smooth. The driveway is gravel but is well maintained. I rented this particular home because of it all being on 1 level. My mother is 84 and uses a walker and one of my sisters has cancer and tires easily. This worked out really well for us. The layout was perfect and the decor beautiful. The site said under amenities there was cable/satellite, there was neither of those provided so it was cartoons or Netflix all week-end. Be sure and bring your own tissue paper also. Overall was a great weekend get away for our family.